"Whilst riding in cold and/orÊRule #9 conditions replete with arm warmers, under no circumstances is there to be any exposed skin between the hems of your kit and the hems of your arm warmers." 'twas but a matter of weeks past that number one son was ready and waiting at the appointed hour on the road junction prior to setting out for the sunday morning ride. this in itself was almost newsworthy, since his being anywhere at the time he said he would be is a rare occurence. bearing in mind that which follows was a first offence, i'm inclined to give him the benefit of a second chance, allied to the fact that the current spate of hebridean weather is so unpredictable that his sartorial circumstances were entirely comprehensible. endeavouring to reach the grand dèpart on time for once and having realised the ambient temperature to be a tad cooler than expected, he had hastily pulled on a pair of armwarmers with baselayer and jersey already in place. this is what we old-timers would refer to as a rookie error, for no matter one's good intent, it will always prove an insurmountable difficulty to pull on the armwarmers sufficiently high to avoid an infraction of the above mentioned rule #82.
obviously, purely with his best interests at heart that he not become the laughing stock of the g.c. ristorante debbie's sunday morning peloton, i chastised him as tenderly as befits that instigated by a less than doting parent. nonetheless, the entire morning, from depart to return, had him fail to 'close the gap' as the rule helpfully suggests. i have great sympathy with those who admonish the efficacy of velominati's rule-making, having carefully honed my own defiance of authority to the point of insignificance. but ignoring the rules does not prevent them from existing in the first place, nor of that nagging feeling that perhaps one ought to toe the line. however, irrespective of your own views on authority, it would be hard to deny that the gap as defined, is hardly a good look, threatening to undermine any athletic prowess that might have formed a part of the morning's demonstration of superiority. 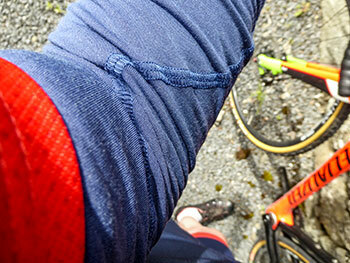 nor indeed, does upper-arm chill form the ideal conditions for a bike ride. but for those who suffer from precisely the same affliction, i may have found the perfect answer: merino armwarmers originating from salt lake city, usa. 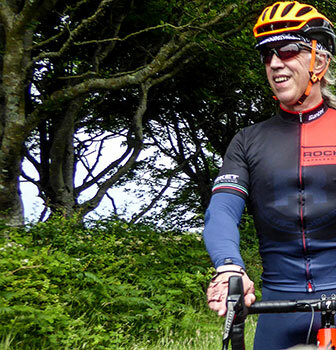 it's a town renowned as the home of mormonism, but from our point of view it is home to jonny hintze's snek cycling, purveyor of the aforementioned armwarmers, as well as a very thin merino cycling cap. i've previously worn and reviewed a very effective woollen winter cap from the same source, and even in the light of the recent purported heatwave (one which, it should be mentioned, failed to make any dent on weather in the hebrides), a pair of blue merino armwarmers were more than welcome. jonny hintze told me that he'd guessed the size required, a size that turned out to be large, one step up from my usual request. but his purported error turned out to be the very best one it was possible to make, for those armwarmers offered a length that comfortably (in both senses of the word) reached from the shoulder joint all the way to my bony wrists. topping them with baselayer and short-sleeve jersey and the chances of infringing rule #82 evaporated into the ether. 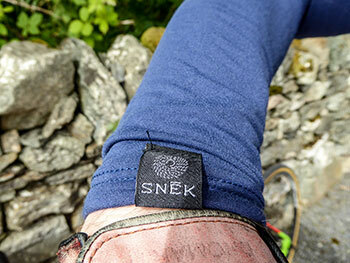 the snek merino cycling cap differs greatly from the more usual casquette in that it is built in a manner allowing complete scrunching to stuff in a back pocket should the need arise. 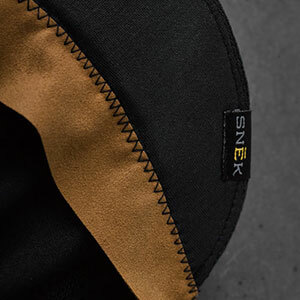 very lightweight, the merino fabric still manages a modicum of thermality while the internally edged suede sweatband keeps the perspiration away from the eyes. 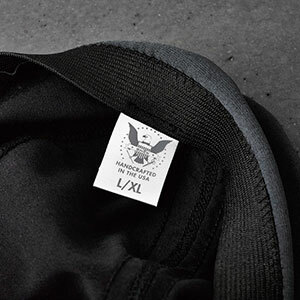 available in two sizes, it's the ideal stylish under-garment to accompany any helmet with a flexible peak that won't break no matter what you do to it, including throwing it into the washing machine, post ride. snek cycling might be a tad idiosyncratic, but it's an idiosyncracy that ought to receive our unfettered applause.